Bright Color Cloth Covers. Bi-directional pages hold 2 horizontal or 1 vertical 4x6 photo. Album Capacity: 200 photos. Includes dust jacket. Memo area. 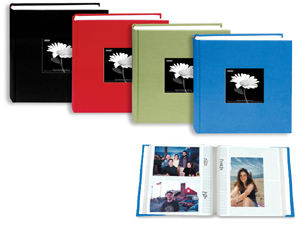 This bound album features a fabric cover and holds 200 photos.